Louisville, KY - March 24, 2018 - Tiffany Hanna, professional driver and trainer at Prime, Inc. is now an owner-operator thanks to the Women In Trucking Association (WIT) and Arrow Truck Sales. Hanna was selected from the applicants who submitted an essay on the importance of attracting more women into the trucking industry. “Women need to know they can be successful in trucking and can do the job just as well, IF not better, than a man,” Hanna wrote. She has been an advocate for female drivers at Prime, Inc. and serves on the Prime Driver Advisory Board. She is also active with the Highway Diamonds celebration hosted by Prime, Inc. annually to honor their female drivers. Hanna is a U.S. Navy Veteran, and the mother of 5 children. She resides in St. Peters, Missouri. She has been at Prime, Inc. since 2014 and a trainer for the past four years. WIT President/CEO Ellen Voie announced the winner on March 24, 2018 during the 9th annual “Salute to Women Behind the Wheel,” at the Mid-America Trucking Show at the Kentucky Exposition Center in Louisville, Kentucky. 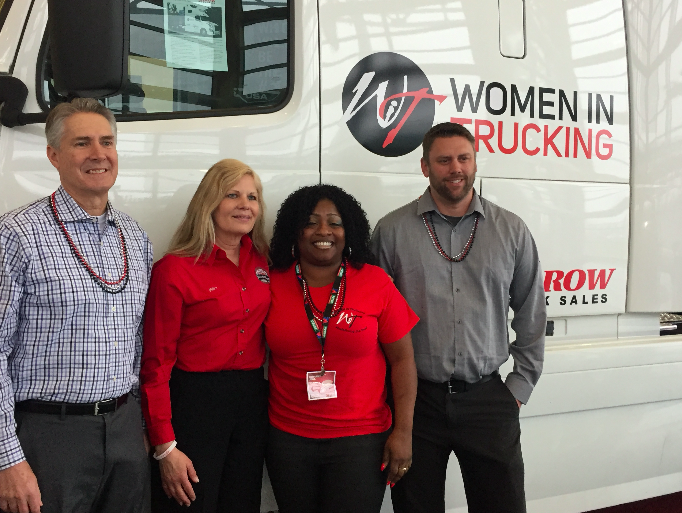 “We are thrilled to hand over the keys to Tiffany, who has been an advocate for women in the trucking industry by mentoring and supporting the women and men at Prime, Inc.," said Voie. "This is truly the chance of a lifetime, thanks to Arrow Truck Sales and their very generous donation,” Voie added. Arrow Truck Sales, Inc. Founded in 1950, Arrow is North America’s leading source of used heavy and medium-duty trucks with retail stores located across the U.S. and Canada. Arrow carries a large inventory of trucks and trailers including all makes and models. Arrow provides a one-stop shopping solution for truck buyers, including financing, insurance, extended warranties and other protection plans. Their national headquarters are in Kansas City, MO. For more information, visit www.arrowtruck.com. Women In Trucking Association, Inc. is a nonprofit association established to encourage the employment of women in the trucking industry, promote their accomplishments and minimize obstacles faced by women working in the trucking industry. Membership is not limited to women, as 17 percent of its members are men who support the mission. Women In Trucking is supported by its members and the generosity of Gold Level Partners: Arrow Truck Sales, Bendix Commercial Vehicle Systems, Daimler Trucks North America, BMO Transportation Finance, Expediter Services, Great Dane, J.B. Hunt Transport, and Walmart. Follow WIT on Twitter, Facebook, or LinkedIn. For more information, visit www.womenintrucking.org or call 888-464-9482.